What in the Wild Wild World of Sports is a’goin’ on Around Here? Eowyn is Remington’s little sister. She’s 16 weeks old. By coincidence on the day he died, Remy’s breeder took her back from the family she’d been placed with because they basically could not handle raising a puppy and were just having too many difficulties. So essentially she needed a home. Normally Rochelle and I would not get another dog so soon. However the breeder made sure we knew that she was available just a few days after Remy died. (As an aside we absolutely adore our breeder Jane. And she does have some dogs available. email me if interested) We’d talked it over quite a bit, it felt weird to get another dog so soon. We didn’t want to replace Remington. And we had talked over getting a rescue dog instead. We decided to wait a little bit and see how we felt. Roughly two weeks after Remington’s death, a rescue opportunity opened up. 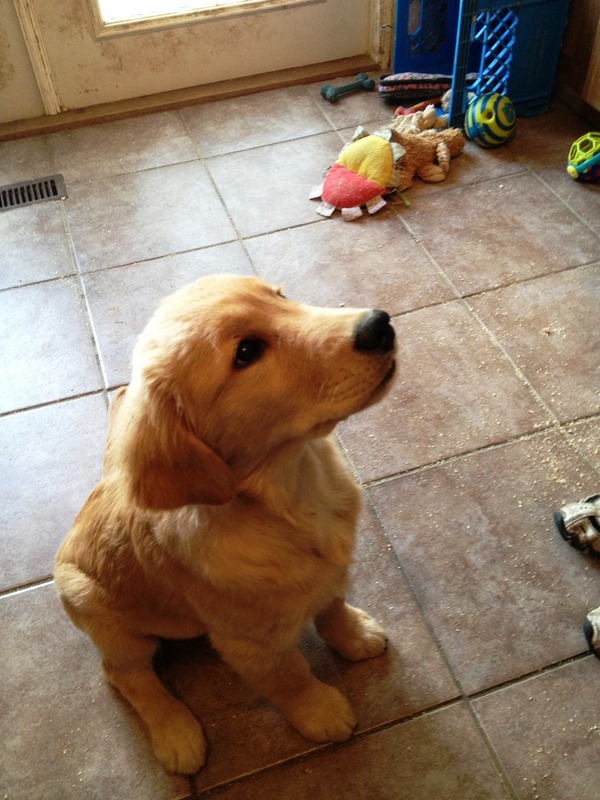 A beautiful male Golden Retriever was found wandering in the Duvall/Carnation area. He was in great health and 4 or 5 years old. A short term foster house was nearing their time to put him into the animal control/rescue system but wanted to find another foster home instead. So we took in this boy, who the fosters had named “Rufus”. It just really didn’t feel right to think about getting a puppy when a happy healthy dog needed our help. As soon as we met “Rufus” we knew someone had to be looking for him. He was just in too good a condition. Beautiful white teeth, handsome coat, good weight, and had been well socialized and trained. But his lack of collar and lack of tattoo or microchip confused us. We were further surprised when we discovered he had an extremely rare and expensive surgery to bypass kidney stones blocking his urethra. No one in the King County area had performed that surgery on a Golden in the past year. We had him examined by our local vet and he had a minor bladder infection so we got him some antibiotics, but even our vet was mystified. It was a puzzle. On the one hand you obviously had owners who had spent a lot of money and time on this dog. On the other hand all the normal tell tales of good ownership in terms of recovering should he be lost weren’t there. The lack of collar bothered me deeply. My only explanation was that he must have gotten out of it, which just reinforced to us that someone was looking for him. We scoured Craigslist and other sites but no good. We called local shelters and looked for flyers. Nada. As the days went on, “Rufus” was really happy in his new home. He responded well to being called “Rufus” and we decided if we could not find his owners we would keep him. He got along great with our other dogs and just fit right in immediately to our family. Apparently this dog was more the husband’s dog than the wife’s because he hopped into his truck immediately and made it to our house in ten minutes. The family had just moved to Carnation from Idaho, where Zeus’ procedure was done. Hence no one in Washington knowing about it. The children had taken off his collar and he had jumped the fence. Not knowing his surroundings since they just moved, Zeus had just taken off to explore and got lost. The family didn’t appear to be Internet savvy, and being new to the state had no idea their resources for finding him. When the front door opened and Zeus saw his papa…well I wish I had filmed it. I don’t think I’ve ever seen a dog or a human so happy together. The husband had been completely wrecked by Zeus running off and had spent 2 weeks trying to find him. The owner just hugged him and rubbed him while Zeus wiggled like a puppy and whined in happiness and licked the poor guy to death. We handed over the medication, told them no charge just please get Zeus microchipped, and sent them on their way. After that, deciding to get Eowyn was easy. So this was the happy Epilogue to Remington’s story. As I mentioned his life was too short, and his ending was sad. But we knew we had an opportunity to give his little sister a home. And somehow her being related to him, available just when we needed her, and that we had just helped out a dog in need made it all seem to click. We said our goodbyes to Remington at a nice little memorial service at his favorite dog park. All Remy’s friends were there that he played with, and our friends too. We ran the dogs tired, fed them special doggy cake, and in general had a great time. Rochelle and I spread Remy’s ashes at each of his favorite spots in the park. The next day we left for Vancouver. At first we told ourselves we were still going to be hesitant, we’d visit first and talk it over and bring her home the next weekend if it was right. Within seconds of meeting her we knew we were going to bring her home. She was so much like Remington but in completely unique ways. Jane agreed. We brought her home yesterday. So say hello to Eowyn! I told you all that to tell you this. 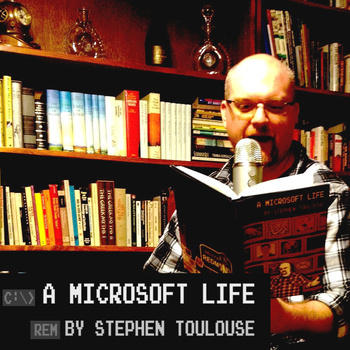 The original release date for the audio version of my book, A Microsoft Life, was supposed to release on 10.12. I had a number of post-production things to do to it, however between getting Zeus back to his owners and work and now Eowyn that sucked up a lot of my time. The good news is that the book should be complete within the next 48-72 hours. As a reminder, 2/3’s of all proceeds will go to Child’s play. If you would like to pre-order you can do so here. I’m not making a big deal about it just yet because I’m finishing up the announcement mail. But if you *really* want to, the pre-order gets you immediate access to 4 tracks. If all goes well I’ll do another post with a formal announcement and information etc. Meanwhile there’s a puppy to play with! Sure is dusty in here. Must’ve left the window open. You continue to show the rest of us how one person/family can make a difference in this world. The reunion story fills me with warmth knowing there are people out there who would work so hard to get my puppies back to me. I must go, there is something in my eye. I loved the story about Rufus, was so very wonderful when I heard it on Major’s podcast and now Eowyn. Of course she can never replace Remington but by the look of it she absolutely captured your and Rochelle’s heart. Can’t wait for the puppy talk to return and laugh again about the escapades of the puppy :). Eowyn is so cute! someone must have been a LOTR fan to name her that. Snap, forgot to put a note on the pre-order. Regardless, looking forward to listening to the book seeing as I haven’t had time to read the Kindle version. I hope Eowyn is happy in her new home but I may have to ask to not read the blog for a while; it keeps making my hayfever play up, or something like that. 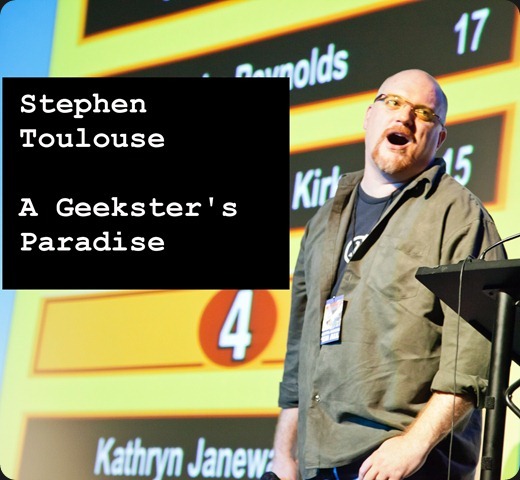 Good things come to good people… Very happy for you Stepto.